The Mount Royal Tunnel (French: Tunnel sous le mont Royal, Tunnel du mont Royal) is a railway tunnel located in Montreal, Quebec, Canada. The tunnel, third longest in Canada, connects the city's Central Station, located Downtown Montreal, with the north side of the Island of Montreal and Laval, passing through Mount Royal. The tunnel was originally proposed by the Canadian Northern Railway (CNoR) to provide access to downtown Montreal without having to cross the already congested area south of Mount Royal or route around it to the east. The cost of the tunnel, along with an expansion to the west coast of Canada, caused CNoR to struggle financially before being nationalized in 1918. Canadian National Railways (CNR), formed from CNoR and several other lines, took over the tunnel which had just been completed. When CNR also took over the Grand Trunk Railway (GTR) in 1923, access to Ottawa and Toronto along GTR lines made the tunnel largely redundant, limited mostly to branch line status. Until 2014, the only trains using the tunnel were commuter trains from the (current) RTM's Deux-Montagnes service. Since December 2014, it is now also used by the Mascouche line serving the northeastern part of the Island of Montreal, then the suburban communities of Repentigny, Terrebonne, and Mascouche. The RTM also wanted to reroute its Saint-Jérôme line trains to Central Station via the tunnel, from their present termini at either Parc or Lucien L'Allier, for a 15-minute time saving. The structure gauge of the Mount Royal Tunnel limits the height of bilevel cars to 14 feet 6 inches (4.42 m). Map of 1927 of the Island of Montreal with the position of the tunnel under Mount Royal shown by dashes on the yellow line; the red line shows a proposed, but never completed, access to Central Station. The tunnel was conceived in 1910 by the Canadian Northern Railway (CNoR) as a means to give the company access to downtown Montreal. The only easy routes along the south side of Mount Royal had long been taken by rivals Canadian Pacific Railway (CPR) and Grand Trunk Railway (GTR). CNoR wanted to avoid crossing the CPR and GTR lines. Likewise CNoR preferred a direct route as opposed to detouring the railway around the north and east sides of Mount Royal. In 1911, the Canadian Northern Montreal Tunnel and Terminal Company was incorporated to build the tunnel and terminal. It was renamed Mount Royal Tunnel and Terminal Company in 1914, and was a wholly owned subsidiary of CNoR. Construction started at the west portal on July 8, 1912. On December 10, 1913, crews from the east and west portals met beneath Mount Royal; they were out of alignment by 1 inch (2.5 cm). The bore measures approximately 5 kilometres (3.1 mi) and has an ascending grade of 0.6% westbound. CNoR placed an order with General Electric in 1914 for 6 boxcab electric-powered locomotives for use in the tunnel; they were delivered in 1916–1917. Lining of the tunnel bore with concrete was completed by 1916 and the 2 parallel standard gauge tracks and 2400 V DC catenary were installed by September 1918. Progress was slowed by the First World War and CNoR's ongoing financial difficulties by the mid-1910s. The first train, with locomotive 601 leading, ran through the tunnel October 21, 1918. The event was little-noticed due to the still-ongoing war and a ban on large public gatherings due to the Spanish flu epidemic. On September 6, 1918, the insolvent CNoR was nationalized by the federal government when its board of directors was replaced by a government appointed board of management, implemented by the Department of Railways and Canals. At the same time, the newly appointed board at CNoR was directed to take over the operation of the government-owned Canadian Government Railways (CGR). On December 20, 1918, the Privy Council issued an order creating the Canadian National Railways (CNR) to operate CNoR, CGR and eventually other bankrupt private-sector railways. Ironically, the Grand Trunk became part of CNR in 1923, giving CNR better routes to Ottawa and Toronto and relegating the tunnel line to branch-line status. Nevertheless, it still remains an essential part of Montreal's regional transport system. CNR took over the Mount Royal Tunnel at the time of its completion, along with the virtually empty lands which CNoR's owners, Sir William Mackenzie and Sir Donald Mann, had envisioned would become a signature real estate development. CNR developed this area sporadically from the 1930s to the 1960s, interrupted by the Great Depression and the Second World War. A new terminal, begun in 1931, opened as Central Station on July 14, 1943, resulting in the closure of the "temporary" CNoR-era Tunnel Terminal near the same location. Central Station consolidated CNR's passenger terminals in the city and also replaced Bonaventure Station which CNR had inherited from GTR. In the late 1950s, the remainder of the CNoR lands acquired in downtown Montreal during the Mount Royal Tunnel project were developed by CNR. The signature Queen Elizabeth Hotel opened in 1958, followed by the CN (name/acronym change in 1960) headquarters building in 1961 and Place Ville-Marie in 1962. On July 1, 1982, CN signed a 10-year agreement with STCUM whereby CN operated the line under contract to STCUM's commuter rail service. On February 12, 1992, Quebec's provincial government announced a $289 million modernization of the Mount Royal Tunnel line, including $130 million awarded to Bombardier for 58 new commuter rail cars. Stations, track, electrification and signalling systems were all upgraded, in addition to the tunnel structure itself. 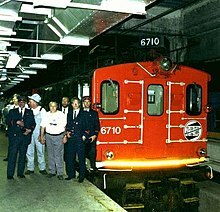 On June 2, 1995, the last of the GE boxcab electric-powered locomotives delivered to CNoR in 1916–1917 for use in the tunnel were retired by CN after nearly 77 years of service. Locomotive 601, which in 1918 pulled the first train into the tunnel, under its final number as Canadian National 6711 pulled the last outbound train; on the return trip it assisted sister 6710. The old rolling stock was replaced by 58 state-of-the-art MR-90 electric multiple units built by Bombardier Transportation. Today, commuter trains from the RTM's Deux-Montagnes and Mascouche lines use the Mount-Royal Tunnel. Before 1995, Via Rail trains to/from Northern Quebec and the northern route to Quebec City (cancelled in 1990) also used the tunnel, being hauled up by boxcabs pre-1990, and coasting downhill. This practice was eliminated when the catenary and signalling were replaced in 1995. The old catenary was 3000 V DC (upgraded from the original 2400 V DC in the early 1980s) and the new catenary is 25 kV AC. The new signalling is CTC. The ventilation shaft is too small to allow the use of diesel electric locomotives in the tunnel. On February 28, 2014, the Réseau de transport métropolitain's predecessor agency (AMT) and CN announced that the AMT had purchased the Deux-Montagnes line from CN for a sum of $97 million. The agreement gives CN trackage rights for freight trains outside two rush-hour exclusive time windows (08:30—15:30 — 20:30–05:30). Also in the works is the double-tracking of the line from Bois-Franc to Roxboro-Pierrefonds, which will enable the RTM to significantly increase the number of trains on the line. Currently, there is a second track from Bois-Franc to slightly past Saraguay (about halfway between Bois-Franc and Sunnybrooke at the A13), but it is not electrified and is used by CN freight trains serving industries along Doney spur. On December 1, 2014, the Mascouche line opened to passengers. The line uses the Deux-Montagnes line until Jonction de l’Est (between the Montpellier and Mont-Royal stations), where it turns onto the St-Laurent subdivision on the way to Mascouche. Trains are operated with the new dual-powered ALP-45DP locomotives, and are initially run under electric power to the Mont-Royal station where the changeover to diesel is done. ^ John, Kalbfleisch. "Opinion: Extraordinary tunnel vision leads to Town of Mount Royal". The Gazette. Archived from the original on 22 April 2013. Retrieved 19 April 2013. ^ Dufour, Marc. "CoupeTunnelDouble" (GIF). La ligne de banlieue Montréal - Deux-Montagnes & le réseau ferré de banlieue. Retrieved 2008-05-13. ^ The standard work on the Mount Royal Tunnel is: Clegg, Anthony (2008) . The Mount Royal Tunnel. Montreal: Railfare Books. ISBN 978-1-897190-41-8. ^ "CN sells Deux-Montagnes rail line to Agence métropolitaine de transports for commuter rail service for C$97 million". News Articles. Canadian National Railway Company. 28 February 2014. Retrieved 17 May 2016.